Kimball’s Peak Three Theater is one of the few theaters that doesn’t rely solely on mainstream large budget films to vagabond its business. Located at the heart of downtown, this theater is uniquely known to screen selected blockbusters alongside independent and foreign films. In its original form, the theater was opened in 1935, housing only one screen and 400 seats. The theater was acknowledged as The Peak Theater. At this time, the theater only had shown “first run films,” according to the website Cinema Treasures. These films were of those most recently released and shown to audiences at a higher ticket price, which is still true to this day for the theater. To maintain a relationship with the new generation of moviegoers, the theater was remodeled twice, once in 1949, and then in the 1960’s. 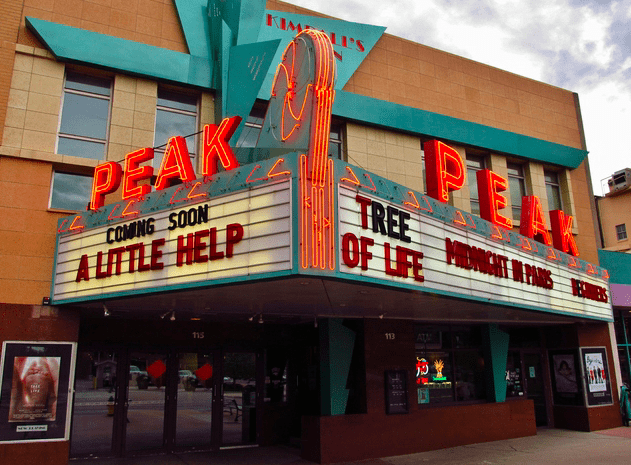 Then in 1988, the Peak Theater had closed its doors and was recognized as the last movie theater to reside in downtown Colorado Springs. In July 1991, Kimball Bayles, a former English professor at the University of Colorado in Boulder, became President of KSB, Inc. at Kimball’s Theaters. During this time, the theater was reconditioned to three screens. The one screen of 400 seats was divided into two, and the upper level of the theater, where the institution’s offices were located, was transformed into the third. Further renovations to the theater included the special addition to a full bar service. Megan Lewis, baker and social media manager, on few occasions has visited the Kimball’s Peak Theater. As a student of CC, he appreciates the close walking proximity that Kimball’s offers. Natalie Sofia Cruz, a senior student at UCCS majoring in secondary education with an emphasis in Spanish, is only familiar with the theater when passing through downtown, never having entered the building. “I see it every time I am downtown,” Cruz said. She also mentioned that it’s more convenient to pay a monthly subscription fee and watch movies from the comfort of home. Bayles remains the present owner of the theater and has managed to survive the vicious and relentless competition of major film distributors found in town, like the Cinemark chain. While these companies may come to be a challenge for the local theater, an underlying competitor might be found in online streaming. “The old-school way of paying for a ticket to go see a movie is slowly becoming less and less appealing” Cruz said. On the opposition, Banmally thinks that the movie theater still holds a fighting chance. “As long as the film industry still relies on theatrical releases, then movie theaters will still be around,” Banmally said. While some members of the current generation may prefer “Netflix and Chill,” getting out of the house and spending your time at The Kimball’s Three Peak Theater is a must for the Colorado Springs community.